Join Lenny Magill and his team of trainers for a dynamic and realistic training experience like no other! All classes are limited in size to make sure each participant receives the proper attention and range time needed to make significant improvements in your knowledge and physical skills. Our staff of qualified firearm experts will assess your abilities and design personalized shooting instruction tailored to your needs. Whether you just want to get more comfortable with your firearm, hone your defensive shooting skills, or begin competition shooting… we have the instructors and facility that will make your goals a reality. Designed to give the participant a true understanding of each part and function of the Glock handgun. This is a complete disassembly class enabling you to identify, name, and troubleshoot every part. You'll have a Glock handgun in front of you that you take apart and put back together under the careful instruction of a GlockStore armorer. And, you'll learn how to install and maintain all Glockstore Performance Parts. The GUNfit Workouts are designed to challenge your ability to shoot fast and accurately based on true self-defense shooting. We don't shoot down a single lane! Each of our workouts provide a unique multi-target course of fire that requires you to shoot in multiple directions... just like in real life! Each session is timed and scored so that you have a realistic understanding of your skill and abilities and can measure your improvements. Available for both handgun and carbine. Be prepared to shoot up to 150 rounds each session. 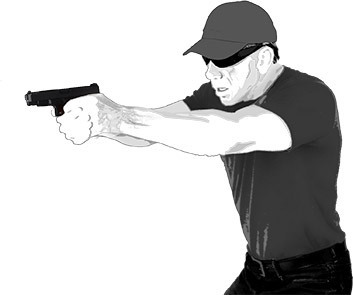 Learn and explore over seven advanced techniques to carry and conceal a handgun for self-defense. Many people practice concealment... not many get to shoot live rounds at realistic target scenarios when drawing from concealment! This class empowers the user with the skills and knowledge to safely carry and conceal a handgun for self-defense. You'll shoot up to 750 rounds drawing from concealment as you would in a real self-defense situation. Concealment holsters provided for testing and evaluation. Four private 1-Hour Sessions with one of our GlockStore Range Instructors, with a customized curriculum based on your experience level and shooting needs. Carrying a concealed weapon (“CCW Permit”) can be a liability or asset to you, your family and your business depending on the PERMITS you hold, the MINDSET you have adopted and the TACTICS you have been trained to implement and practice. CCW USA is a full service defensive firearms training agency that gives you not only a permit solution, but also the practical tools needed to manage the stresses and tactical requirements of a gunfight. Offering Gun Safety Courses for every member of the family.